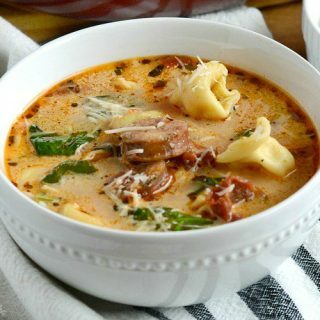 Easy Chicken Sausage Tortellini Soup is loaded with Italian chicken sausage, cheese tortellini and spinach in a light tomato cream broth. 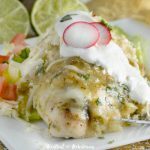 This quick and easy dinner takes just 20 minutes to make and is picky-eater approved! If you’re looking for a quick and easy soup recipe that you can make with items from your pantry and fridge, this easy chicken sausage tortellini soup recipe is for you! 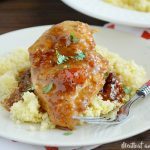 It uses just a few ingredients, and it doesn’t require a lot of prep work, so it’s perfect for busy days when you need dinner on the table fast! You probably all know how much I love my Instant Pot, right? But you guys, this tortellini soup is one of those recipes that’s even faster to make on the stove. You could definitely make this soup in a pressure cooker, but you really don’t need to, and you’re still only using one pot to cook dinner. Besides, the Hubs got me a gorgeous little red Dutch oven for Christmas, and I feel like I’ve been neglecting it in favor of the Instant Pot. So the other day, I used the Dutch oven to make my family’s favorite One Pot Creamy Chicken Sausage Tortellini for dinner. And, it occurred to me that I could easily convert the pasta recipe to a delicious soup recipe, with just a few changes. The whole idea behind the pasta and this easy soup is to get dinner on the table fast, using pantry items and a few things from the fridge. And friends, there are times when you have time to make a gourmet meal completely from scratch, and there are those days when you gotta do what you to feed your family a decent meal, right?! This tortellini soup starts out with smoked Italian chicken sausage, which is already cooked, so you just need to brown it for better texture and flavor. I use Aidells, but you can use any brand. 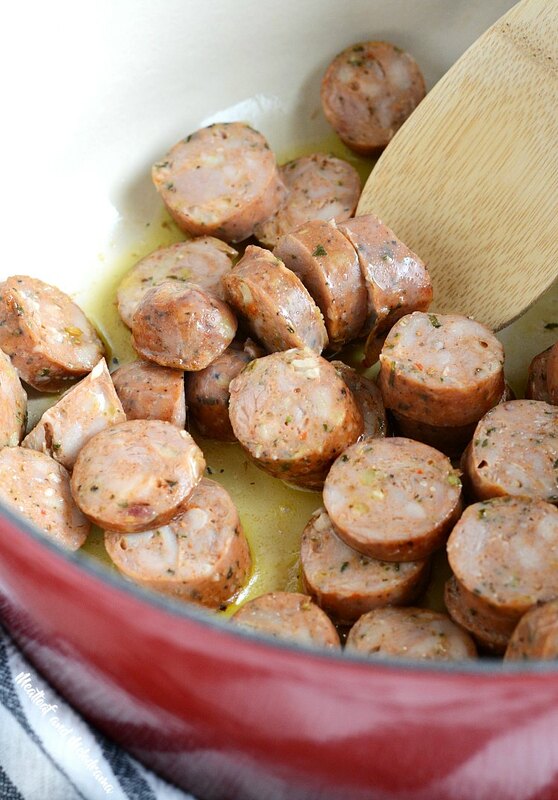 And since the sausage is already seasoned, you don’t need to add a bunch of spices for flavor. After you brown the sausage, you just add the remaining ingredients and heat everything up. The tortellini takes just 4 minutes to cook, so it goes in near the end. The spinach is last, since it cooks super fast. The broth is on the lighter side, since that’s what we prefer. If you want a creamier soup, you can add more heavy cream. And if you want more tomato flavor, you can add more sauce or even use crushed tomatoes, instead. 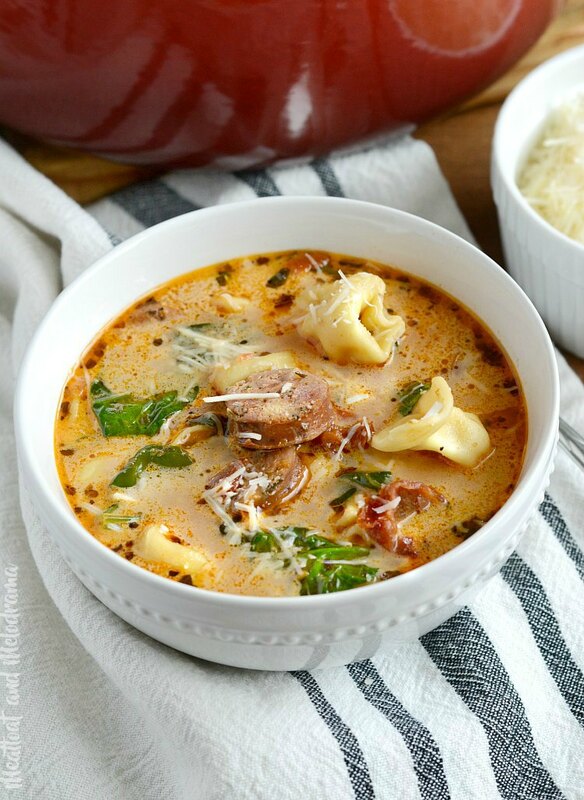 There really are no rules for this quick and easy tortellini soup! Looking for more quick and easy soup recipes? 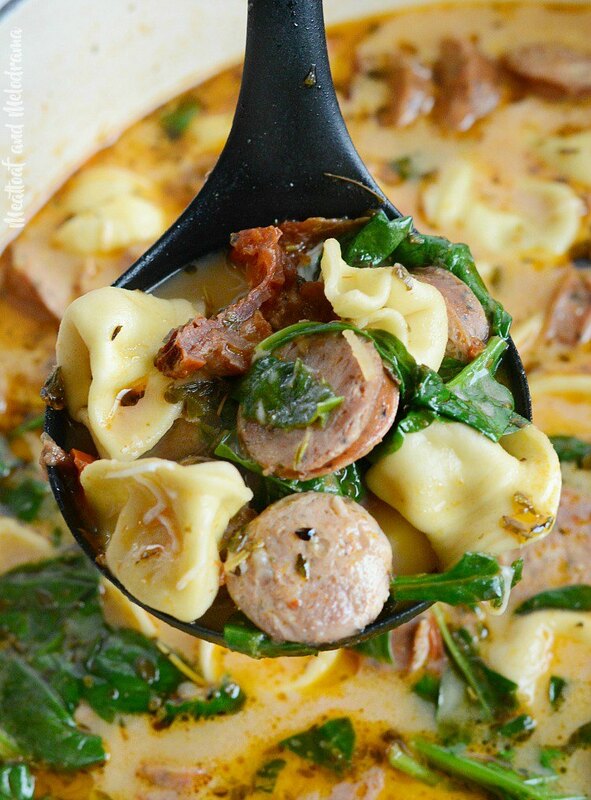 Easy chicken sausage tortellini soup is a quick and easy dinner loaded with Italian chicken sausage, cheese tortellini and fresh spinach in a light tomato cream broth. 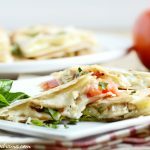 Ready to eat in only 20 minutes! For a thicker soup, add another cup of tomato sauce or marinara sauce. 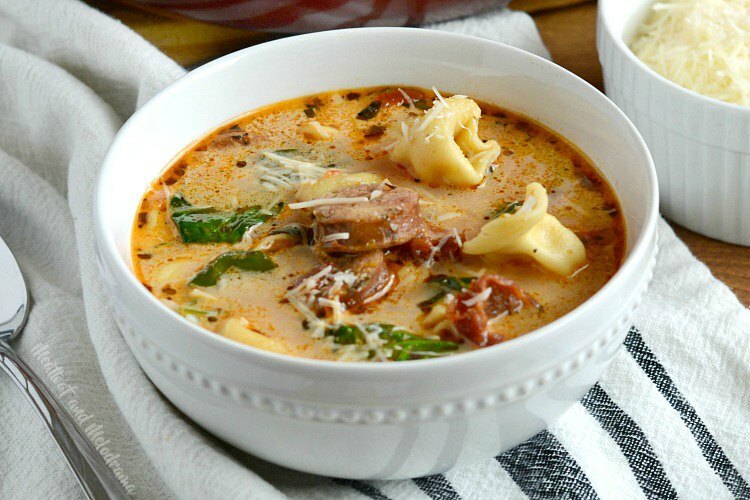 My family absolutely loved this easy chicken sausage tortellini soup! The kids even went back for seconds! I hope you enjoy it as much as we did. I love how easy this is to make! This soup looks perfect to warm you up on a cold day! This looks like the perfect lunch! Thanks, Paula. My family definitely approved! I love a good soup! Right now I am all about soups! Tortellini soup is a weakness of mine. I could make this soup everyday! Mmmm! I could definitely go for a big bowl right now. 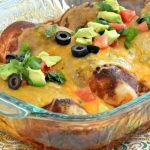 I know I’m going to crave this until I make it — it looks amazing! Hey Dee….! i love chicken and your chicken sausage…soup looks sooo yummy & delicious, i will make it in upcoming few days. Thanks for sharing…. I am craving a big bowl of this soup right now! Yum! Your Tortellini Soup will be awesome! Hope you are having a great day and thanks so much for sharing with us at Full Plate Thursday and come back to see us real soon!